What is the Google Chrome’s T-Rex game? Most users have experienced a disruption in their internet connection at one time or another. At such times, it is impossible to work with applications that require an internet connection and the logical thing to do it to take time off your computer and rest. However, Google thinks otherwise. With the new built-in game in the Chrome browser (September 2014), the search engine giant seems to push users to remain on their PC and get entertained while waiting for the computer to come back online. Although one could say that Google has the best intentions in adding this feature because the game is hardly accessible and also has limited features. The game might have been created by Google’s witty developers who felt that a mini-game was an exciting add-on, while testing the browser’s offline features. Eventually, the management bought the idea and here we are today with a computer game right inside Google Chrome. The story behind the game may be fascinating, but that so much the game. 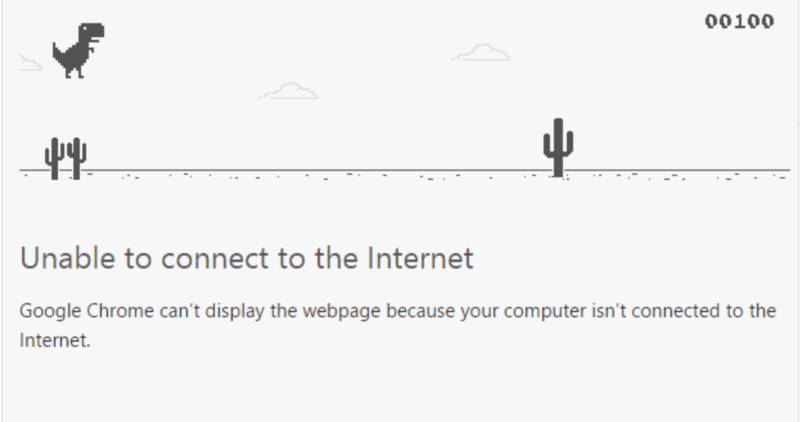 This side-scrolling game entails leading Chrome’s offline dinosaur across the screen while dodging the spiny cacti by making the beast jump using the spacebar. The scoreboard is in the top right corner of the screen. Pressing the F5 key or the restoration of the Internet connectivity will terminate the game and reset the score to zero. The new feature is only accessible on the daily builds of the browser for the Windows and Mac platforms. With this basic game, Chrome has joined the bandwagon of applications that amuse the users with mini-games, distracting their attention from the mindless waiting by having fun. The antecedence of this feature dates back to the computer medieval times, when loading an app could take minutes to complete, so the developers add elements of fun with a mini-game. Lately, this feature has been spotted on YouTube where the app embeds a snake game in buffering screens. However, this feature only works when the browser is using the Flash render rather than the HTML5 display. This means only users using Firefox or other browsers that support Flash can enjoy the feature. NextNext post: How is it possible for the T-Rex game, which is embedded in the browser, to be activated in an offline mode? What’s your high score in the game? How does Chrome’s T-Rex Game end? Is there an actual end? 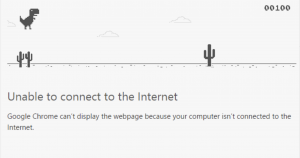 Who’s the creator of Google Chrome’s T-Rex game? Why isn’t T-Rex game visible in the Google Chrome? Is it possible to play with Google Chrome’s T-Rex when I’m online without turning the WiFi off?